Taymour Grahne Gallery is delighted to announce its participation in the fourth edition of Untitled Miami. 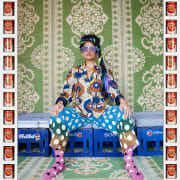 Located in Miami Beach between Ocean Drive and 12th Street, the gallery will present a solo booth of recent work by acclaimed London-based artist Hassan Hajjaj. This year’s selection will include an immersive salon style installation, in addition to a new series of photographs. Hajjaj’s works are in the collections of the Brooklyn Museum, New York; the British Museum, London; the Nasher Museum of Art, Duke University, Durham, NC; the Newark Museum, New Jersey; LACMA, Los Angeles; the Victoria & Albert Museum, London, among others.